Have you ever wondered what happens to your skin when you go to the beach and expose yourself to sun rays? We can still enjoy being in the sun, we just need to use the resources available to us from long sleeves to shade to sunscreens in order to protect the molecules in our skin, especially our DNA from UV damage. Buying sunscreens is not an easy thing to do, you can’t just make your purchase based on the SPF (sun protection factor) rate or the brand, it is more complicated than this and if you think this will fully prevent sunburn and most skin cancer, you better not be fooled by labels and adds. 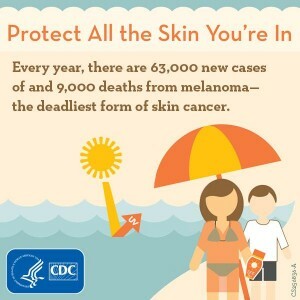 Most sunscreens are water resistant but actually they are not waterproof or sweatproof and need to be reapplied every 40 or 80 minutes with an amount enough to fill a shot glass to cover the exposed areas of the body they also offer broad spectrum protection against UVA and UVB rays and an SPF of 30 or higher which blocks 97% of the sun's UVB rays (no sunscreen can block sun rays 100%) for example if it takes 20 minutes for your skin to start turning red, using an SPF 15 and higher prevents reddening 15 times longer , about five hours , all this helps to protect your skin from sunburn and early skin aging but not from all types of skin cancer, that’s why dermatologists advise you to seek shade between 10 a.m. and 2 p.m. where the sun rays are the strongest but higher SPF sunscreens require higher concentrations of sun-filtering chemicals that may pose health risks when they penetrate the skin, for which they have been linked to tissue damage and potential hormone disruption and allergic skin reactions. The UVA rays(ultraviolet A) are the ones responsible for aging your skin causing wrinkles and dark spots while the UVB(ultraviolet B) rays are the ones that burn your skin, the world health organization have declared UV radiation from the sun and artificial sources(tanning beds) as a known carcinogen (cancer-causing substance) and both UVA and UVB rays can cause melanoma the most dangerous form of skin cancer that lead the skin cells to multiply rapidly and form malignant tumors, as evidenced by laboratory studies on people with extreme sun exposure. Although too much sun exposure can damage your skin but it is a vital source for vitamin D essential for growing and maintaining strong healthy bones and supporting a strong immune system and unfortunately there is no safe way to tan cause each time you tan you damage your skin and speed up aging and increase your risk for all types of skin cancer , also you can’t safely tan under a cloudy sky, the sun’s rays can penetrate clouds and get to your skin , and that brown beautiful color you get is nothing but a response to an injury to your skin cells that produce more pigment in response to UV ray sun damage. That’s why safe sun exposure is very essential and simply staying in the shade is one of the best ways to limit a sun damage ,but if you are not you must remember to put on a shirt , a hat and sunglasses to protect your fragile area of your body like the eyes and skin around them and in case you do develop a sun burn, immediately apply raw Aloe Vera , it’s one of the best remedies to help accelerate skin healing , always check the expiration date on the sunscreen to be sure it’s still effective , most sunscreen products are good for at least 2 to 3 years if they are not left exposed in the heat for a long period of time for they become less effective.